Shabbychick Junk. : The bees knees. Well, I got one of my stamping goals checked off my list this week, which was to finish up my September birthday cards! 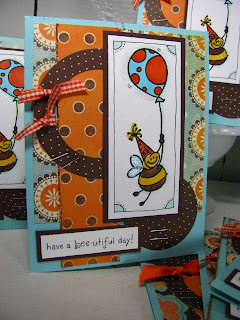 I was digging through some old stamped off images that I have in my stash, and discovered these cute Archivers Exclusive birthday bees that I had stamped off from a fellow Splitcoaster at a stamping retreat I was at in March! So they finally got put to use, and the beautiful thing is that they were already stamped off, so I was able to crank out 10 of these cards last night. I used an old layout from a card I did a while back and tweaked it a bit, using fall colors (browns and oranges) and OLD PAPER FROM MY STASH! GIT R GONE, GIRLS, GIT R GONE! I always fall into use-it-up mode this time of year. The patterned paper is old My Mind's Eye Magnolia Serene "Our Family" flowers and "All about me" dots. 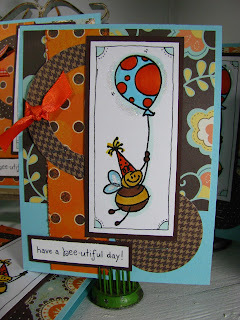 The brown polka dot is from a Stampin Up "Bella Rose" paper pack. What tends to happen in use-it-up-mode, is that I set a goal of 10 cards, but inevitably run out of the patterned paper I'm using. So I tweak the papers a bit to use up scraps of a similar colored paper, with the same layout and same colors. Have a bee-utiful day, everyone! These are a great set of cards, love the colours and stamp. 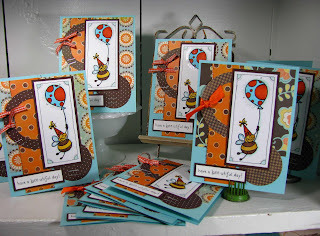 Zapstar.....you are stamping so many cards and I am loving every minute of it. 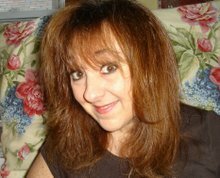 It brightens my day to visit your blog, read your news, and see your inspiration for all us stampers. Thanks, babe!! Keep up the good work...and as usual you inspire me to use it up. Oh these are lovely! Where can I get hold of a stamp like this? Very cute, Lisa! These are the bees knees!! Great birthday cards...I love your motto "Get r gone"...I get in the purge mode in fall, too. Hey Lisa! These are so much fun!! Gawd Lisa, You are the one of the most talented stamper's in the whole world. I just love love love your designs..............always so Funky!